The spongy air-filled conical organs occupying most of the thoracic (chest) cavity in humans are known as the lungs . It is one of the primary respiratory organs where the gas exchange occurs after the inhaled air enters the lungs via the trachea, through the bronchi and bronchioles . Humans have two lungs, the left lung, and the right lung. They are of different sizes and are divided into multiple lobes . A healthy lung has a pinkish appearance, and if you could see it outside the body, it would look like a squishy, rubbery structure . The lungs are located a little toward the posterior part of the human body, just below the collarbone, extending down to the diaphragm, the muscular partition that separates the chest and abdominal cavities. The left and right lungs are situated on the two sides of the body with the heart, another vital organ in the thoracic cavity, located a little in front of, and at the middle of them . They are also surrounded by the rib cage, along with other organs in the chest cavity . Each lung has an apex, base, root, and hilum or hilus of the lung, as well as three surfaces, keeping the lung connected to the sides of the thorax . The apex is the superior part of the lungs, with its highest point located above the first rib, extending through the superior opening of the thoracic cavity, into the inferior floor of where the neck starts . The base is the concave lower surface of the lung that rests over the diaphragm . Structures including the bronchus, bronchial veins and arteries, pulmonary artery, two of the pulmonary veins, pulmonary plexus of nerves (anterior and posterior), and lymphatic vessels bundle together to form the root of the lungs [9, 10]. This root not only connects the two lungs with each other but also keeps them suspended in the thoracic cavity. The structures of the root enter/leave the lung via the hilum . It is the wide depressed area located just a little higher than the center of the medial surface of the lungs . In adults, each lung is 25cm to 30cm long, with the right lung being a little larger than the left lung as the former has three lobes while the latter only has two. If the surface of the lungs could be spread out flat, the total surface area of the two lungs together would be over forty times greater than that of the outer surface of the human body, making them one of the largest organs . 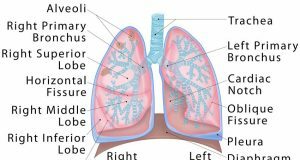 The right lung is divided into the superior (upper), middle and inferior (lower) lobes . These are further separated into ten segments . The left lung is a little smaller than the right one (to make space for the heart), and is divided into the superior (upper) and inferior (lower) lobes. Even though there are only two lobes, the upper lobe has a projection, referred to as the lingula (meaning ‘little tongue’ in Latin) that serves as an equivalent to the middle lobe of the right lung . 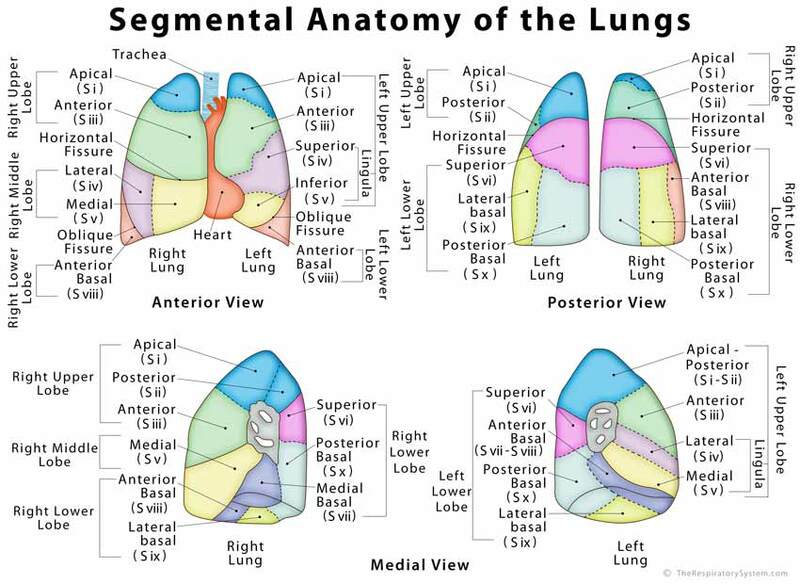 Know more about the lung lobes and their segments. Both the left and right lungs have an oblique fissure separating the superior lobes from the inferior lobes , while in the right lung there is a horizontal fissure to keep the middle and superior lobes apart . A pleurae is a two-layered serous (fluid-filled) membrane that covers the lungs, providing a cushion to protect it from trauma and also to facilitate the process of respiration . There are two pleurae in the human body, covering the two lungs. The outer layer or parietal pleura lines the inner walls of the chest cavity, while the inner or visceral pleura is attached to the outer surface of the lungs . The two layers form a hollow space between themselves, which is known as the pleural cavity and is filled with pleural fluid, so the two pleural layers do not stick to each other . 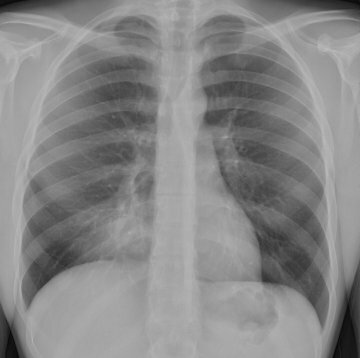 The area around the middle of the thorax, between the right and left pleural sacs, is known as the mediastinum . The space is divided into the inferior and superior mediastinum. The inferior mediastinum is larger between the two and further separated into the posterior, middle, anterior and mediastinum . It is the convex or dome-shaped sheet of muscle that both the lung bases rest upon . The diaphragmatic surface of both the lungs has a concave shape to accommodate the shape of the diaphragm. One of the vital muscles in the respiratory system, it separates the chest cavity from the abdominal cavity [25, 26]. Costal Surface: The convex, smooth surface, facing the inner surface of the wall of the thorax. It covers the largest area among the three surfaces of the lung . The costal pleura keeps it separated from the ribs and the deepest intercostal muscles (muscles running between the ribs, keeping the rib cage flexible) . Mediastinal Surface: The surface between the left and right lungs, it houses the hilum. It also covers the part of the lungs next to the heart . The left lung has a deep indentation, referred to as the cardiac notch, along its mediastinal surface to make space for the apex of the heart . These two surfaces meet each other at the apex , while they are separated at the base by the inferior border of the lung .The smooth and rounded area at the back, where the costal surface and the mediastinal surface meets, is marked as the posterior border . Diaphragmatic Surface: As the name suggests, this is a concave basal surface, facing the diaphragm. The right lung has a deeper concave base as it is positioned higher to make space for the liver located beneath [7, 30]. The structures in the lungs directly responsible for the function of respiration collectively form the lung parenchyma. It includes the bronchial tubes, blood vessels, alveoli, and alveolar ducts [31, 32]. As the windpipe reaches the lungs, it divides into the left and right primary bronchus, which then enters the left and right lung respectively . Once inside the lungs, the bronchi divide into narrower tubes called bronchioles, while this again branch into terminal bronchioles, the smallest respiratory tubes in human lungs. 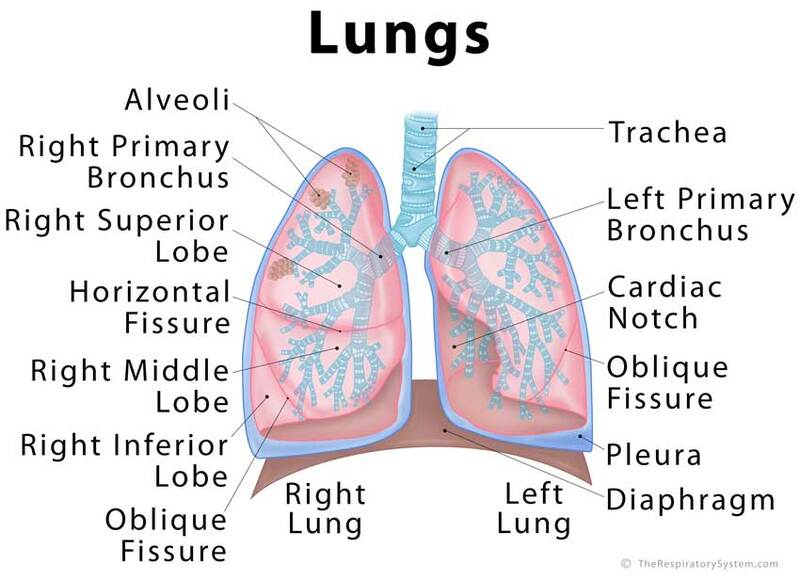 This intricate structure in each lung is called the bronchial tree. Both bronchi and bronchioles are encircled with hyaline cartilage rings to help them maintain their shape . Tiny air-filled sacs, alveoli are the primary functioning units of the lungs, the actual site of gas exchange. A healthy person has 300 to 700 million alveoli (480 million in average) , meaning there are around 150 to 350 million alveoli in each lung. The inner walls of the alveoli are lined with a thin layer of water and surfactant, known as the pulmonary surfactant, a protein-lipid mixture secreted by type II alveolar cells . It plays a crucial role in reducing the surface tension of the alveoli to prevent them from collapsing during gas exchange. This, in turn, helps the lungs to maintain their shape . Each lung has one pulmonary artery and two pulmonary veins. The pulmonary artery carries deoxygenated blood to the lungs where it receives oxygen and then is carried back into the heart by the pulmonary veins . There are usually two bronchial arteries on the left and one on the right, to supply the lung roots, visceral pleura, bronchi, and other supporting lung tissues with oxygen-rich blood [39, 40]. The bronchial veins drain the bronchi and the structures in the hilum, as well as some other supporting structures . The nerve supply to the lungs and some of its associated organs and muscles comes from branches of the vagus nerve and the phrenic nerve . The lungs are responsible for inhalation and exhalation, the method in which the body gets oxygen and gets rid of carbon dioxide . As documented by the American Lung Association, an adult person generally takes 15-20 breaths per minute, and about 20,000 breaths per day . When we inhale, the air enters through the nasal cavity, traveling down via the pharynx, larynx, and trachea to enter the lungs via the two primary bronchi. Then it reaches the alveoli, the small air sacs in the lungs where the gas exchange occurs, through the bronchioles . The one-cell thick walls of the alveoli have an intricate network of blood capillaries . As the oxygen-rich air reaches these alveoli, the blood flowing through the capillaries takes up the oxygen in the method of diffusion occurring across the thin walls of the alveoli and the capillaries (the process in which a substance moves from an area of low concentration to an area of high concentration) . 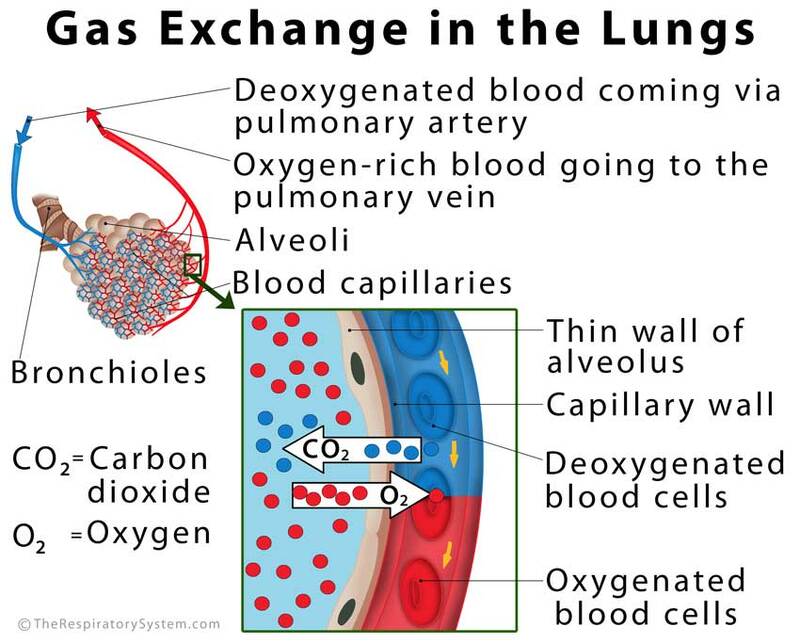 Similarly, the carbon dioxide carried by the blood from the different organs and tissues of the body are absorbed by the alveoli so they can be excreted along with the exhaled air . TLC refers to the maximum volume of air the lungs of an adult person can hold. It is the sum of the air released by the lung after a maximum exhalation (vital capacity or VC) and the volume of air left behind within the lungs after a deepest exhalation (residual volume or RV) . The TLC of human lungs is 6 liters . Lung compliance is the measurement of the lungs’ capacity to expand with the changes in air pressure during breathing . Both TLC and lung compliance are measured for the diagnosis and treatment of various lung disorders. The lungs function as a pair of bellows, pulling in fresh air into the body when they expand, and expelling the impure air when they compress. However, there are no muscles in the lungs to control this expansion and compression. The diaphragm, the muscle lying below the lungs, helps in pumping the lungs, with the help of the abdominal muscles, and intercostal muscles . The diaphragm and abdominal muscles contract and expand to increase and decrease the volume of the lungs, while the intercostal muscles control the space within the rib cage. During inhalation, the diaphragm relaxes and extends towards the abdominal cavity to make the air from outside rush into the vacuum within the lungs, with the intercostal muscles making sure that the rib cage has enough space to accommodate the inflated lungs. Similarly, during exhalation, the diaphragm pushes upward into the lungs so they recoil, putting pressure on the alveoli, which then expel the carbon dioxide-rich air [34, 50]. When we inhale, the air that enters the respiratory tract is usually full of impurities like dust particles, pollen, etc. . Some of these get trapped in the nasal cavity by nose hairs to cleanse the air partially. The rest of the cleaning is done by the mucus membrane lining the airways, the trachea, bronchi, and bronchioles, where any remaining foreign particles are trapped in the sticky mucus secreted by goblet cells . It makes sure no harmful substance comes in contact with the blood capillaries during gas exchange. Then, the respiratory cilia, the tiny hair-like growths covering the inner walls, sweep the impurities stuck in the mucus back towards the opening of the respiratory tract, where they can be excreted through the nose or mouth . The oxygen-rich blood travels through the pulmonary veins into the left atrium, and then the left ventricle of the heart, from where it is pumped out to reach each and every cell in the body . Then, the cells receive the oxygen and send the carbon dioxide produced by the cellular functions into the blood to be carried by the superior and inferior vena cava veins to the right atrium, from where it reaches the right ventricle. This deoxygenated blood is then pumped back to the lungs by the right ventricle via the pulmonary artery. There it releases carbon dioxide and gets oxygen so it can again supply the whole body . Lung Cancer: There are three types of this lung cancer, non-small cell, small cell, and lung carcinoid tumor. These three vary in their rate of growth of the cancerous cells, requiring different treatment options. The non-small cell type is the most commonly occurring lung cancer, with subtypes including squamous cell carcinoma and large cell carcinoma . Excessive smoking is one of the most common causes of lung cancer, and common symptoms include wheezing, coughing up blood, and breathing troubles. Standard treatment measures include chemotherapy, radiation, and surgery . Chronic Obstructive Pulmonary Disease (COPD): The term collectively refers to multiple lung conditions including emphysema and chronic bronchitis. One of the characteristic signs of COPD is hyperinflated lungs, where the air gets trapped inside the lungs because of blocked airways, making it hard to inhale and breathe . Other symptoms may include coughing up mucus, lungs hurting when you cough, and feeling out of breath. These often result from exposure to irritants like cigarette smoke, and chemical fumes . Asthma: One of the most common breathing and lung-related disorders, asthma is characterized by inflamed and swollen airways that make it difficult for air to pass through them, leading to symptoms like shortness of breath, congestion, wheezing, coughing, chest tightness, and fatigue . The condition also leads to excess mucus production which accumulates in the airways, blocking them. Asthma has no cure, with treatment including medications, inhaler, and certain lifestyle changes for management . Lung Metastasis (Secondary Lung Cancer): A type of cancer that started in some other part of the body and then the cancerous cells travel and spread to the lungs (metastasis) . Laryngeal, thyroid, breast, and kidney cancers, as well as soft tissue carcinoma, are a few types of cancers more likely to affect the lungs . Symptoms are similar to those caused by general lung cancer, and treatment includes detecting the tumor, and its primary location so there are no cancer cells left in the body. Pulmonary Embolism: A life-threatening disorder characterized by blood clot formation within the lungs. It might occur after a major surgery, as a complication of conditions like a heart attack or cancer or due to smoking too much . Symptoms include shortness of breath, rapid heartbeat, discoloration of the skin, coughing up blood, chest pain, and fainting. Anticoagulant drugs are used for treating the condition, while severe cases may need surgical removal of the blood clots . Pulmonary Nodules (benign growth on the lungs): Sometimes, there is a small nodule or growth in your lung that shows up as a small spot on CT scan and chest x-ray reports . Such growths can be both malignant and benign, but over 90% of those smaller than 2cm in diameter remain harmless . Bronchiolitis Obliterans (Popcorn Lung): A serious lung condition characterized by scarring, inflammation, and narrowing of bronchioles, the smallest of the airways. The name popcorn lungs come from the fact that it may result from inhaling a chemical often used in flavoring microwave popcorn . Wheezing, shortness of breath, dry cough, and fatigue are the common symptoms. It is often incurable, most cases being managed with medication that prevents further blockage of the bronchioles. Severe cases may call for a lung transplant . Black Lung Disease (Coal Workers’ Pneumoconiosis): Caused by chronic inhalation of coal dust, it is usually seen in those working in a coal mine for over 18-20 years, causing the lungs to appear black, instead of the general pink . The coal miners’ pneumoconiosis may not cause any serious symptoms, but it may advance into another more serious condition called progressive massive fibrosis or PMF that may hamper normal lung function. There are not many treatment measures for the black lung disease as patients often need to manage the condition through some healthy lifestyle changes, like giving up smoking, getting enough fresh air, and stopping working at a mine . Another occupational lung disease is farmer’s lung, where prolonged exposure to pesticides, molds, and dust from animal feed, grass, grains, etc. leads to chronic breathing problems, cough, and fatigue. This only affects people allergic to those substances . Pneumonia: A condition usually caused by a bacterial infection, pneumonia leads to inflammation and fluid accumulation within the alveoli of the lungs. It may cause chest pain, trouble breathing, congestion, fever, sweating and chills, coughing, and appetite loss . Treatment includes antibiotics and other medications along with lots of rest. Pleural Effusion: It occurs when there is a fluid buildup around the lungs, between the two layers of the pleural membrane. More common among people who regularly smoke and drink alcohol, its symptoms are similar to those caused by most other lung diseases. Sometimes, the excess fluid may be removed through a surgical puncture in a method called thoracentesis . Interstitial Lung Disease: A group of different disorders, all affecting the net-like tissues surrounding the lungs (interstitium), causing it to thicken due to scarring, inflammation, or fluid buildup . Treatment depends on the cause and nature of the condition. Punctured Lung (Pneumothorax): If air somehow accumulates between the pleural membrane layers, it traps the lung, preventing it from inflating while taking in air, causing the restrictive lung disease known as a punctured or collapsed lung. It leads to a bluish coloration of skin (due to lack of oxygen), shortness of breath, and chest pain among other symptoms. In some cases, it may not need treatment, while in others, extra air is pumped into the affected lung to help it expand . Lung Infections: There are a number of fungal and bacterial infections that can affect the lungs, including aspergillosis (caused by Aspergillus fungus), fungal pneumonia, and bronchitis (can be bacterial or viral). These may result from an allergic reaction to something you inhale, such as mold, certain chemicals, or if you come to direct contact with some contaminated substance.